Preheat oven to 350°F degrees. Toss rhubarb, strawberries, brown sugar, flour and sea salt in a bowl. 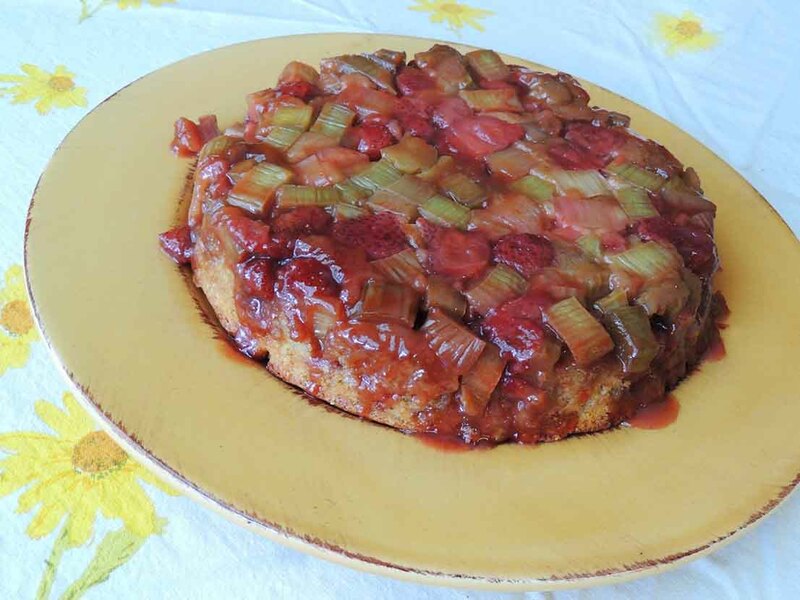 Pour ¼ cup melted butter into a 9″ round pan and top with the rhubarb mixture. For the batter, combine melted butter and sugar. Beat in egg, apple cider vinegar and vanilla. In a small bowl, combine flour, baking powder, and sea salt. Add flour mixture alternately with the milk to the butter mixture. Stir just until combined. Spread the batter over the fruit. Place pan on a rimmed baking sheet and bake 45 minutes or just until a paring knife comes out clean. Remove from oven and let cool in the pan for 20 minutes. Run a knife around the edge of the cake and invert onto a platter. Serve warm or at room temperature with ice cream or whipped cream, if desired.